Resources, solutions and basic knowledge for engineering and design of technical applications! - Integrates seamlessly with Visio! Generally, engineering diagrams include electrical schematics; digital and analog logic, circuit and wiring schematics and diagrams; power systems diagrams; maintenance and repair diagrams for electronics and electrical engineering, Process Flow, Piping & Instrumentation Diagrams for chemical and process engineering, the Part and Assembly, Pneumatic and Hydraulic Systems Drawings for mechanical engineering. Edraw is a powerful engineering diagram maker that helps to visualize industrial systems in electronics, electrical, chemical, process, and mechanical engineering. Its objective is to visually communicate concepts, architecture and design of complicated industrial engineering systems to simplify and ease the understanding, analysis and presentation. Since Edraw's purpose is to draw diagrams and drawings to visually present, analyze and report the production cycles, industrial processes and technological systems, industrial projects and R&D. The following people will greatly benefit from it. It is intended for: industrial engineers, production managers, researchers and developers. STREAMLINED SOFTWARE: Engineering diagrams are used in designing and updating chemical or plant process. Engineers and technicians will appreciate Edraw's streamlined P&ID, PFD and electrical software. 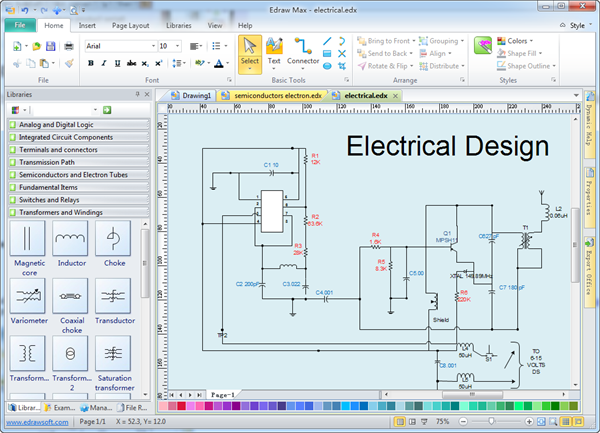 Drag-and-drop simplicity, keyboard shortcuts, and interactive elements make Edraw the perfect engineering diagram creator. SMART SHAPES: Each shape is designed with the end user in mind. Our team has added detailed diagramming options for fast, precise drawing. And since Edraw's symbols are vector-based, your P&IDs will be outstanding in any professional context. FREE EXAMPLES: Whether you're working on your own or with a team, Edraw is the right engineering software for you. With smart shapes and an intuitive drag-and-drop interface, you can build complex diagrams in the fastest way. No drawing skill or experience is required. The 100% integration with MS programs enables seamless collaboration with others. You can transform your engineering diagrams into 18 formats. As mentioned above, Edraw's symbols for engineering diagram are all designed for easy creation. They are smart shapes that know how to act according to users' demand. Some of them have floating action buttons and control handles that allow instant change of the shape. You can change one shape into various styles by just clicking the floating button. All shapes are designed with connection buttons so that auto connection can be gained. See some symbols below. Getting started from examples is the quickest way to draw engineering diagrams. For users' ease, many ready-made examples are offered. These examples can be used directly or with some minor changes. They are editable, printable and sharable for free. To test out our premium P&ID software with a free 30-day trial, just click on the following button.